Standardization has long been accepted as a fundamental element of patient safety by the APSF and others. The International Organization for Standardization (ISO) was established in Geneva in February 1947 initially to help standardize industrial development. Since then the scope of ISO has expanded to cover, among many other matters, anesthesia apparatus. As the world becomes a smaller place with regard to the manufacture of such equipment, it is becoming commonplace for many components of anesthesia workstations to be manufactured with a global market in mind. This takes on greater significance as health care staff become increasingly able to move around the world to practice their specialites. It therefore seems even more appropriate in 2014 that all ISO standards should be adopted globally. Figure 1. Around the world there still appear to be some major differences in the way that medical gases are presented, with the most important of these being the color coding of oxygen for both cylinders and pipelines, which can be white, green, or blue even within the same country. Anesthesia, which is recognized as leading the way on patient safety, already has some global standards e.g., user applied medication labels1 and the International Standards for safe practice of anesthesia.2 As the specialty continues to promote patient safety, it seems incongruous that the published international standards of our basic primary/core complement of oxygen, medical gases, and suction are not adopted by all countries. Indeed, without such a fundamental adoption, our speciality’s credibility in this aspect of our work would seem to be called into question. Different colors may not be seen as a major problem in elective work although deaths still occur.5 Yet, when an emergency or anesthetic crisis occurs, reflex actions are more likely to be taken and this could result in serious harm. This problem was highlighted at the most recent World Congress of Anaesthesiologists in Buenos Aires Argentina in 2012 when all the delegates from over 120 member societies of the World Federation of Societies of Anaesthesiologists voted unanimously in favour of the adoption of a worldwide standard color system for medical gases. The WFSA Assembly fully supports the principle of one global standard for the colors and labelling of cylinders and pipelines used for the supply of oxygen and other medical gases. The WFSA Assembly calls upon our colleagues in industry, government and other relevant bodies to join with us and take all the necessary steps to achieve this single standard for the safety of patients all around the world. It has been suggested that there is no real problem perceived at present and if countries which did not currently follow ISO standards were to change then this might create considerable risks that might impact on patient safety. This is an interesting risk/benefit debate. Any widespread changes would require careful management, but these should not be a reason to resist improvement in care. The ISO standards for medical gases have been modified several times since they were first published, and the implementation of these changes did not result in any problems as far as the authors are aware. Is it not reasonable and logical to assume that, in the future, color coding of medical gases will be standardized? So the sooner this change is made, the better. As the world’s population continues to increase dramatically, any problems in implementing the change to a global system (and we believe there need not be many) will potentially increase every year they remain unchanged and be much greater in future years. Anesthetic and surgical actitivity is expected to increase significantly. In 2004 it was estimated there were 230 million operations.8 In 30 years, even if only the low-expenditure countries rate of surgery per 100,000 population increases to that of the middle-expenditure countries, with the world’s population then at 9 billion a conservative estimate would suggest 380 million operations per year. Before this expansion takes place it would seems sensible to have these ISO standards adopted ahead of this almost doubling of worldwide investment in new anesthetic and surgical facilities. "Hogertrafikomlaggningen" took place when the whole country transferred to driving on the right hand side of the road. The mortality rate from traffic accidents fell immediately and it took 2 years before rates were back to the pre-change level.9 There is no expectation that any changes resulting from the adoption of the ISO standards would take place overnight, but this Swedish example provides concrete evidence that radical changes can be implemented when there is agreement and determination to carry them out. In recent memory Switzerland, Germany, and Austria changed to the ISO standards for medical gas cylinders and no problems were reported. Discussions with our industrial partners who manufacture and supply medical gases and anesthesia apparatus indicate that they would fully support the implementation of one global standard.10 Why wouldn’t they? It is a no-brainer that particularly in difficult economic times they would want to only have to manufacture and distribute one series of products, again increasing safety and reliability for them as well as patients and anesthesia professionals. Any changes could be carefully planned and managed across health care systems. Most of the costs could be covered by routine maintenance. Gas cylinders are regularly returned to be refilled and could be repainted then. 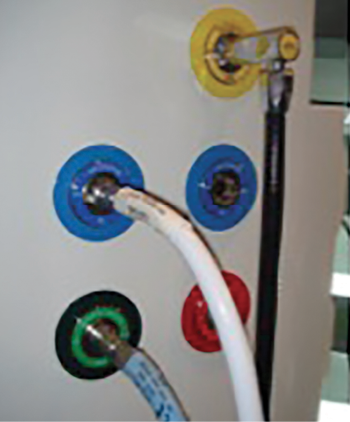 The color-coded, low-pressure, flexible hoses that connect the machines to the gas pipelines-system wear and deteriorate and need changing every 5 years for safety, so their replacement could be easily be coordinated appropriately in a hospital. Similarly, wall connectors that get changed less frequently for engineering developments could certainly be incorporated in all new buildings/refurbishments. As with the adoption of other standards hospitals will have to plan their introduction locally. This rarely happens overnight and the full involvement of our manufacturing colleagues, who will also benefit from a simplified/standardized production and supply chain will be vital. So is there a way forward? Superficial consideration makes some pessimistic colleagues think it may be insurmountable. But with cooperation, initiative and goodwill it could be exceedingly easy. There already is an ISO standard for color coding of gas cylinders, which has been adopted by many countries.3 We would like to see all anesthesia providers around the world adopt this standard and lobby for its introduction in their own country by a specific date. If the profession as a whole could successfully coordinate and lead to deliver this it will be a wonderful achievement to demonstrate our speciality’s global commitment to patient safety and a milestone and model for others to follow. An initial move might be the organization of a Medical Gas Summit which brings together all those with an interest in this field, anesthesia professionals, manufacturers, and safety experts, etc., to have face to face discussions on how this might be implemented. If anesthesia can achieve this it will send an important signal to all the other specialities in medicine and other professions that such important global standardizations can be achieved for universal benefit and make our increasingly smaller world a safer place. The authors would like to acknowledge the help and advice provided by Phoebe Mainland (Melbourne) who is the WFSA/ISO Liaison representative. David K Whitaker, Chairman, European Board of Anaesthesiology Safety Committee. David J Wilkinson, President, World Federation of Societies of Anaesthesiologists. ISO 26825:2008. Anaesthetic and respiratory equipment—User-applied labels for syringes containing drugs used during anaesthesia—Colours, design and performance. Merry AF, Cooper JB, Soyannwo O, et al. International standards for a safe practice of anesthesia 2010. Can J Anaesth 2010;57:1027-34. ISO 32:1977. Gas cylinders for medical use—Marking for identification of content. Medical gas pin index cylinders. Using with a regulator. Available at: http://www.bochealthcare.co.uk/internet.lh.lh.gbr/en/images/409080-Healthcare%20Pin%20Index%20Cylinder%20Instruction%20Guide%20leaflet409_85740.pdf. Accessed April 1, 2014. Herff H, Paal P, von Goedecke A, et al. Fatal errors in nitrous oxide delivery. Anaesthesia 2007;62:1202-6. Brand C. Green for danger. New York: Dodd and Mead, 1944. Weiser TG, Regenbogen SE, Thompson KD, et al. An estimation of the global volume of surgery: a modelling strategy based on available data. Lancet 2008;372:139-44. Egger Halbeis CB, Cvachovec K, et al. Anaesthesia workforce in Europe. Eur J Anaesthesiol 2007;24:991-1007. The Examiner September 2, 2009. Sweden finally began driving on the right side of the road in 1967. From http://www.examiner.com/article/sweden-finally-began-driving-on-the-right-side-of-the-road-1967. September 2, 2009. Personal communications. Linde Healthcare, Draeger, and GE Healthcare.